What started as a small rumbles of experiments in digital space had grown into a business setup - OoBI. And it got acquired last month by a Real Estate online portal PropTiger. This marks the new beginning of next innings. Newborns, infants are like blank slates. They either learn a lot on their own. And a lot is derived from elders. Whether true of false the learning from elders sets the basis of what infants are going to accumulate and comprehend. Startups are like infants in industry. To make an serious impact of Design in industry we need to nurture it right from infancy. Hence it becomes very important that Design becomes and integral part of startup ecosystem. However currently Design is perceived as a short term goal which are a point in lifecycle of a product/company comes to halt and the same state carried forward. The way product/company evolves its functionality will also evolve and so will be the complexity. And hence the role of Designer becomes critically important in the infancy phase of startup to lay the right foundation. I am visiting my own online diary after very very long time. And it had taken really long thoughts for me to come back and start writing. I have been busy with work and life. And that means learnt a lot. It was all going in head waiting to come out. And when I start writing I am unable to decide what to write. There is so much of it that I have to sit back again and decide. And in times where microblogging has taken up importance than long paras it becomes rather more difficult. Before writing this I did see what others (those whom am following) have written. And to my astonishment even they (who are regular bloggers) haven't posted since almost a year. Well is this a change that we are seeing. From a Designers perspective it is very important to understand the psychology shift of users and bloggers. They have moved to a medium which is more close in their vicinity. Users always resort to something that's immediately available to them and try to get their work done as much as possible from that closest object/medium. With the onset of smartphones and cheaper dataplans, users have started blogging or rather giving status updates from mobile itself. Unless long blogging/writing is earning you bread, its highly unlikely that you'll even open a blogger and post. This also explains the success of twitter, pinterest, facebook. 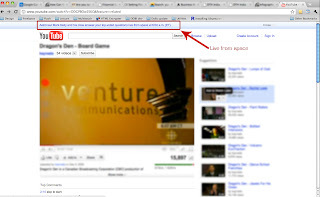 Successful will be the one which allows normal users to bring their small nuggets that they have posted at different places and show up as one big post. These are times of electronic publishing. 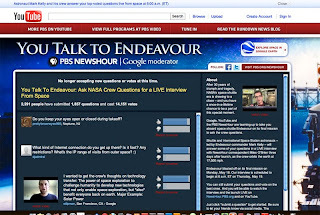 I was watching some show on Youtube today and found this tiny little header at the top of youtube page which read that I can talk with the astronauts in the space LIVE. 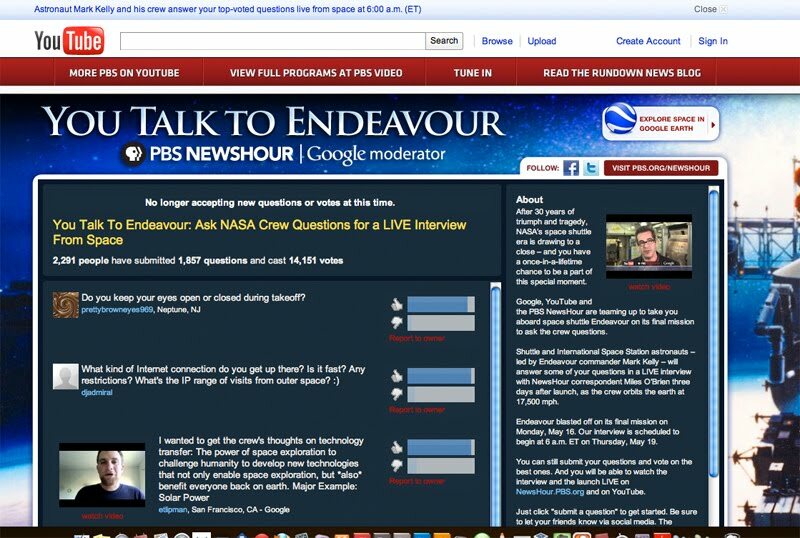 This is a great moment for common man to get to know what is it like to talk to astronauts in space live. Well Design not necessarily means order. Randomness is an equal contender of being a good Design. Important aspect of good design is a pattern. A pattern that we have seen somewhere and if we see it again we are sure to relate and recognize and most probably remember. Take for example the simple dressing that I did for my food. 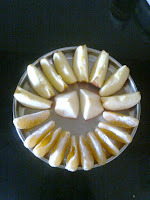 I cut these fruits and put it on plate in some pattern (circular here). And later if you happen to see a webpage or a print on sari which has similar sort of structure/layout your brain will immediately bring forth this pattern and you'll make a relation. As a Designer you have to keep practicing these traits and everyday routine and that's how it'll get imbibed in your brain, your subconscious mind at least. View more presentations from David Sherwin. As a designer, our role is to convey the message using the most suitable medium. Medium may not be perfect, but it at least eases the task of end user to perceive the message. And as a designer though our prime focus is on end user, skipping needs and greeds of stakeholders may bring havoc. So how do you handle those situations wherein what you anticipated, rather inferred from research and user studies doesn't sound good to stakeholders. They don't see the value and you are sure that it is the correct way. You have to persuade them. Either being nice and polite or strict showing consequences. And what type of consequences? 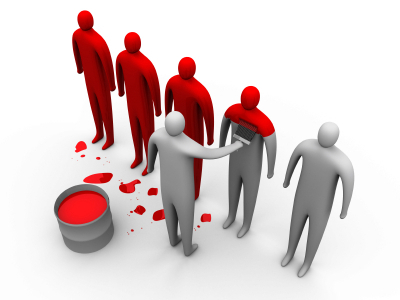 You might think of terminating the project and vowing not to work with such clients anymore. But take a pause and think where the problem is. Most of the time its communication gap. They assume that you'll assume the same thing they assumed ! Stumped. But literally they always think that the product is going to take the form they have assumed cause, they have been talking to you. As a designer you should have the skills and capability of taking out the unsaid from the mind of your stakeholders/users. They can't perceive or see what you can and its true vice versa too. So based on my experience, I would say be persuasive in nature. Provide enough evidence. Statistics might not make sense but a story would. And this soft skill will not only help your professional life, but a personal one too.